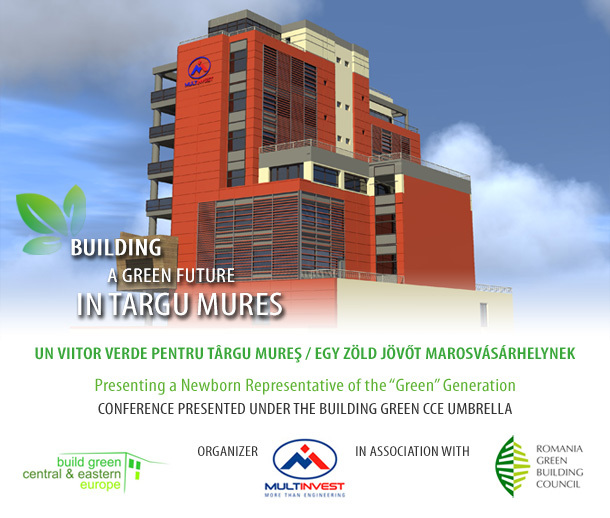 On September 28th, Romania Green Building Council held, at the Athenee Palace Hilton, a one day course on “Greening our Hotels – Green Hotels in Romania too”, in order to engage the hospitality industry and its related products and services in a discussion regarding the opportunity and importance of a more environmentally responsible approach of architectural design, rehabilitation and dealing with properties. 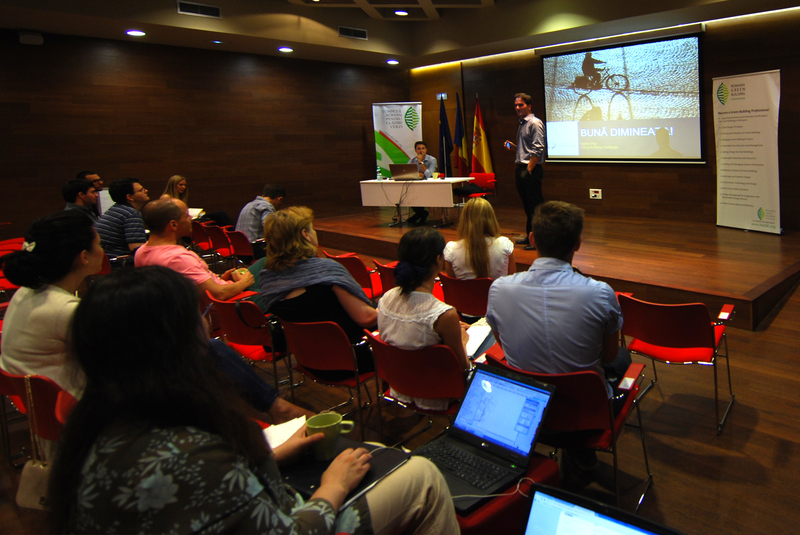 The workshop provided practice information about integrating available technologies in the design of more energy efficient and with low environmental impact buildings. In addition, the course was structured so that the participants had the time to interact with the speakers, during the “question& answer” sessions. First part. Competitive advantages for building/ refurbishing green hotels. In his welcoming speech, Steven Borncamp, president of RoGBC, gave a short introduction to the importance of the “green approach” in designing and operating new buildings, increasing international and local regulations for building materials and energy consumption, as well as the need for more action for generalized sustainable principles for all types of buildings. Stressing that “green” stands for quality, present and future, Mr. Borncamp also mentioned that for a slight increase of the costs for a green building (with 2-4%), the cumulative savings are about 40% per year, while the investment amortization is being done in the first 2 or 3 years. Next, Linda Griffin, the new general manager of Hilton Athenee Palace, presented some recent actions that aim at reducing electricity consumption, promoting ecological means of transportation (bicycles for customers) and creating a Green Team, which would be involve in implementing sustainable initiatives in the hotel network as well as initiating a “customer awareness” program on environmental behaviors during accommodation. David Nicholl- general manager of Schneider Electric- had a comprehensive overview on the benefits of generalized automation systems in all types of buildings, including hotels. Through the Active Energy Management systems, significant, controllable and predictable reductions are being made, throughout the building, while ensuring optimum comfort for residents. The integrated Schneider Electric solutions can lead to constant electricity and heat consumption reductions up to 30% in the long run. 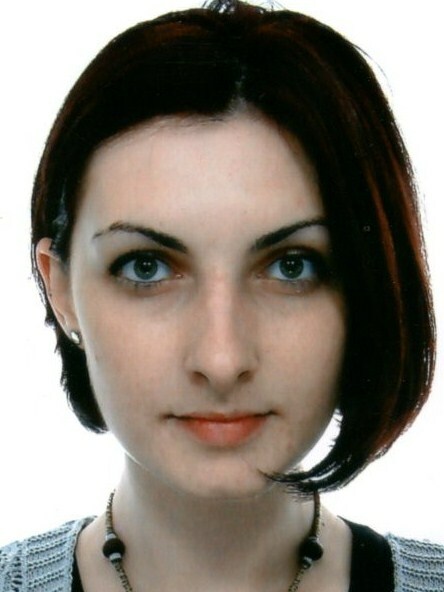 Ms. Maria Daniela Toma – manager in Ministry of Environment– tackled issues of the environmental labeling of hotels. Introduced after 2005, eco-labels represent green building certification, based on 20 criteria which include, among others, indicators of ecological materials use, presence and quality of the vegetation in the site area, energy and water consumption, waste storage and recycling, cleaning systems’ efficiency, information about preventive ecological behavior etc. Specific matters regarding general aspects and regulations of green label certification are available on www.eur–lex.europa.eu. The fee for obtaining this certification is presently 200-300 euro/year. Furthermore, two case studies were presented. Linica Stan, manager Saturn Hotel, presented the case of Saturn Hotel, Mangalia, while for Crowne Plaza Hotel, Bucharest, the presentation was held by Melania Secuianu, Administrative Manager Crowne Plaza Hotel. Mark Velody – BERD consultant – held a methodological overview of financial procedures, with favorable interest or grants for energy efficient building projects. 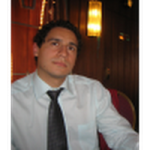 Rafael Mărculescu – Schneider Electric – completed David Nicholl’s presentation through an application of energetic management integrated systems. He showed that the implementation of this kind of systems is very useful for all types of hotel equipments (heating/ HVAC/ water management, lighting etc.) and that the investment amortization for Schneider systems is up to 3 years, meanwhile noticing reductions of 35% for heat, 60% for electricity, as well as the number of employees. David Clark – Cundall Engineering – presented a hotel case study, underlining the three aspects – energetic benchmarking, clarifying the CO2 footprint criteria (design, passive/ active system, energy efficiency and the recovery of energies) and users’ information/ education, in this case the tourists. In the last part the presentations were about a) particular solutions (products and systems) for a successfully implementation of significantly reduction of electricity consumption, lighting through efficient LED and mercury light bulbs (Cuneșteanu – Philips România), b) packaging waste management (Lorita Constantinescu – Eco-Rom Ambalaje) and c) sustainable solutions for green spaces design, through water management and special effects for the aesthetic part and for air quality improvement (Katja Perrey – Katja Perrey Landscapes). Romania Green Building Council (www.RoGBC.org) is a non-profit and non-political association which encourages the development of market, educational and legal conditions necessary in the transformation of the building industry, in order to create and refurbish intelligent buildings, both sustainable and profitable. 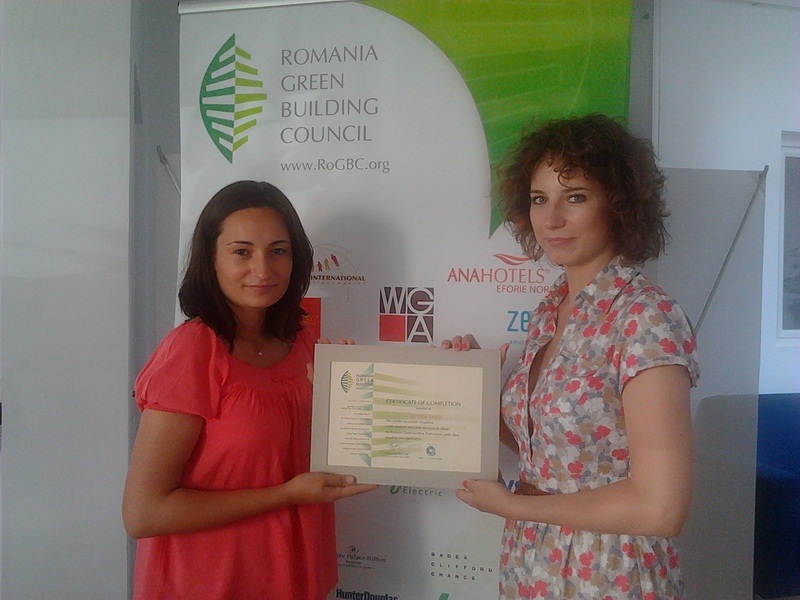 RoGBC is an “Established Council” within the World Green Building Council (www.WorldGBC.org) .